2011 Recruiting Class Finalized, Clowney Going Elsewhere. 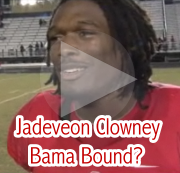 Jadaveon Clowney had Alabama & South Carolina as his final two schools with an announcement to be made on February 14th. Alabama fans were giddy in thinking that the #1 prospect was possibly going to pick the Tide, however Clowney is now fading in his choice of Alabama. The #1 reason is "proximity." I had a feeling about this recruit when I seen in a video that his mother did not want him to go too far off. That usually is a bad sign for a recruit so far away, but you can't get them all. Word is that he is now considering Clemson. If he picks Dabo Sweeney's (Alabama alumni) Clemson Tigers, their recruiting class will be very strong this year with the pick up of several 5 star recruits including the likes of Steward, who was surprisingly pulled away from the Seminoles on signing day. Well, there you have it... most likely unless Coach Nick Saban has another rabbit to pull out of his hat for Jadaveon, then you can pretty much say that Cyrus Kouandjio was the final "cherry on top" of this year's recruiting class.